AVO reported that no evidence of activity at Semisopochnoi had been detected since an explosion was recorded in infrasound data on 31 October. The satellite link for transmitting seismic data failed on 1 November, though no activity was observed in satellite or infrasound data since then. As a result, the Aviation Color Code was lowered to Yellow and Volcano Alert Level was lowered to Advisory (both are the second lowest levels on four-level scales) on 21 November. A plume originating at about 52°N, 180° and extending 90 km ENE was noted by Steven Shivers from a NOAA 9 satellite image returned 13 April at 1731. On an image at 2135 the same day, the plume extended only 15 km ENE. On 24 April, pilot Harold Wilson (Peninsula Airways), flying 50 km SE of Semisopochnoi, noted a very dark-colored peak (perhaps Sugarloaf) among other snow-covered mountains on the island. Plumes from Semisopochnoi were reported several times in the 18th and 19th centuries. Information Contacts: J. Reeder, ADGGS; T. Miller, USGS, Anchorage; W. Gould, NOAA/NESDIS. AVO reported that two small explosions at Semisopochnoi were detected in seismic and infrasound data on 31 October. Intermittent seismic tremor was recorded on 1 November but later that day the satellite link that transmits seismic data failed. Weather clouds obscured views of the volcano during 31 October-4 November. Nothing was observed in satellite data during 5-6 November. The Aviation Color Code remained at Orange (the second highest level on a four-color scale) and Volcano Alert Level remained at Watch (the second highest level on a four-level scale). AVO reported that an eruptive event at Semisopochnoi began at 2047 on 25 October based on seismic data; strong volcanic tremor lasted about 20 minutes and was followed by 40 minutes of weak tremor pulses. A weak infrasound signal was detected by instruments on Adak Island (260 km SE). The Aviation Color Code was raised to Orange (the second highest level on a four-color scale) and Volcano Alert Level was raised to Watch (the second highest level on a four-level scale). A dense meteorological cloud deck prevented observations below 3 km (10,000 ft) a.s.l. ; a diffuse cloud was observed in satellite data rising briefly above the cloud deck, though it was unclear if it was related to eruptive activity. Tremor ended after the event, and seismicity returned to low levels. Small explosions were detected by the seismic network at 2110 and 2246 on 26 October and 0057 and 0603 on 27 October. No ash clouds were identified in satellite data, but the volcano was obscured by high meteorological clouds. Additional small explosions were detected in seismic and infrasound data during 28-29 October; no ash clouds were observed in partly-cloudy-to-cloudy satellite images. AVO reported that during 3-9 October seismicity at Semisopochnoi remained elevated, with intermittent bursts of tremor. No volcanic activity was detected in infrasound or satellite data. The Aviation Color Code (ACC) remained at Yellow and Volcano Alert Level (VAL) remained at Advisory. On 16 September AVO raised the Aviation Color Code (ACC) for Semisopochnoi to Yellow and Volcano Alert Level (VAL) to Advisory after increased seismicity was detected at 0831. Retrospective analysis of satellite data acquired on 10 September revealed small ash deposits on the N flank of Mount Cerberus, possibly associated with two bursts of tremor recorded on 8 September. This new information coupled with intensifying seismicity and a strong tremor signal recorded at 1249 on 17 September prompted AVO to raise the ACC to Orange and the VAL to Watch. Seismicity remained elevated on 18 September with nearly constant tremor being recorded by local sensors. On 25 March AVO reported that seismicity at Semisopochnoi that had begun in January continued and had increased over the previous few days. Brief periods of tremor were also detected. AVO raised the Aviation Color Code to Yellow and the Volcano Alert Level to Advisory. The elevated seismicity, characterized by discrete fairly small earthquakes beneath the center of the island, continued to be detected through 7 April. AVO reported that the earthquake swarm that had started at Semisopochnoi on 9 June continued until 23 June. No eruptive activity was indicated. The Aviation Color Code remained at Yellow and the Volcano Alert Level remained at Advisory. AVO reported that an earthquake swarm at Semisopochnoi started at 1000 on 9 June and escalated at 1200 on 12 June. The continuation of the anomalous activity prompted AVO to raise the Aviation Color Code to Yellow and the Volcano Alert Level to Advisory on 13 June. The earthquake swarm was continuing as of 17 June. Five of the six seismic stations on the volcano were operational. Semisopochnoi, the largest subaerial volcano of the western Aleutians, is 20 km wide at sea level and contains an 8-km-wide caldera. It formed as a result of collapse of a low-angle, dominantly basaltic volcano following the eruption of a large volume of dacitic pumice. The high point of the island is 1221-m-high Anvil Peak, a double-peaked late-Pleistocene cone that forms much of the island's northern part. 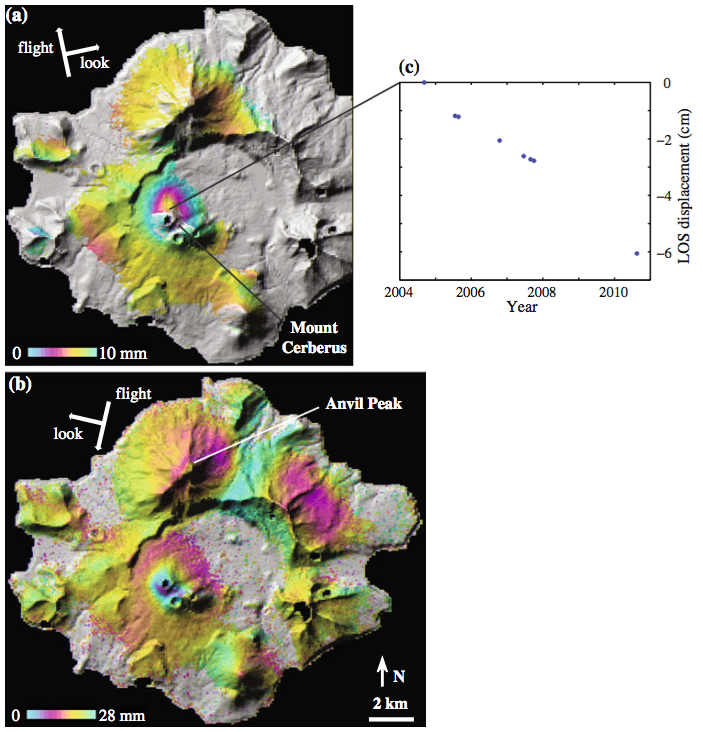 The three-peaked 774-m-high Mount Cerberus volcano was constructed during the Holocene within the caldera. Each of the peaks contains a summit crater; lava flows on the northern flank of Cerberus appear younger than those on the southern side. Other post-caldera volcanoes include the symmetrical 855-m-high Sugarloaf Peak SSE of the caldera and Lakeshore Cone, a small cinder cone at the edge of Fenner Lake in the NE part of the caldera. Most documented historical eruptions have originated from Cerberus, although Coats (1950) considered that both Sugarloaf and Lakeshore Cone within the caldera could have been active during historical time. Coats R R, 1959. Geologic reconnaissance of Semisopochnoi Island western Aleutian Islands Alaska. U S Geol Surv Bull, 1028-O: 477-519. Delong S E, Perfit M R, McCulloch M T, Ach J, 1985. Magmatic evolution of Semisopochnoi Island, Alaska: trace-element and isotopic constraints. J Geol, 93: 609-618. 1987 Apr 13 Unknown Confirmed 2 Historical Observations Sugarloaf ? Remarks: Deformation centered on Mt. Cerberus is probably caused by surface processes such as contraction of volcanic deposits, gravitational sliding, and mechanical compaction. There is no Emissions History data available for Semisopochnoi. An aerial view of the SE coast of Semisopochnoi Island shows conical Sugarloaf peak (left-center) with its double parasitic cone (foreground) that was the source of one of the more recent flows. Sugarloaf was erupted outside the southern margin of an 8-km-wide caldera cutting Semisopochnoi. Cloud-draped Mount Cerebus was constructed within the caldera and forms the left horizon. Pre-caldera Ragged Top (right) shows a remnant constructional surface on its seaward face. Photo by U.S. Navy (published in U.S. Geological Survey Bulletin 1028-O). 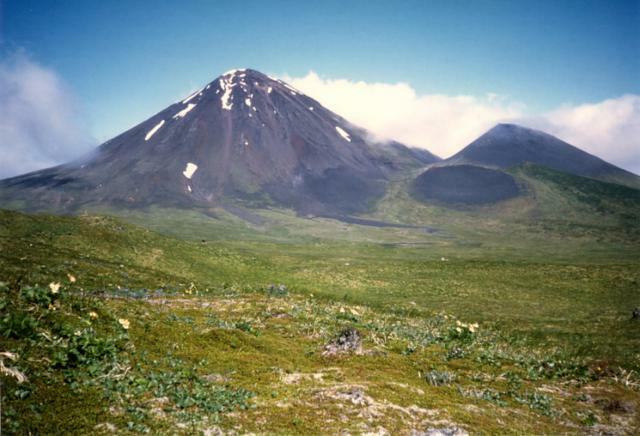 The western slopes of symmetrical Sugarloaf Peak (left) rise above tundra-covered Semisopochnoi Island. Semisopochnoi, the largest subaerial volcano of the western Aleutians, is 20 km wide at sea level and contains an 8-km-wide caldera. Three-peaked Mount Cerberus volcano was constructed within the caldera during the Holocene, along with symmetrical Sugarloaf Peak volcano outside of the caldera to the SSE. Most documented historical eruptions have originated from Cerberus. Photo by Steve Ebbert, 1997 (U.S. Fish and Wildlife Service). Large Eruptions of Semisopochnoi Information about large Quaternary eruptions (VEI >= 4) is cataloged in the Large Magnitude Explosive Volcanic Eruptions (LaMEVE) database of the Volcano Global Risk Identification and Analysis Project (VOGRIPA).